Cannes Yachting Festival is almost upon us. Now less than eight weeks away, Vieux Port, the Riviera’s oldest port, will again host the world’s biggest shipyards, including the nautical magicians of Italy, Mangusta. Indeed, this is where it started for the 54m fast displacement superyacht, the Mangusta GranSport 54. Unveiled at MYS in 2015, the concept was taken back to the drawing board and reevaluated to maximize style, efficiency and comfort, resulting in an LOA extension of 6m. Hull number one subsequently sold shortly after 2016’s Cannes Yachting Festival. 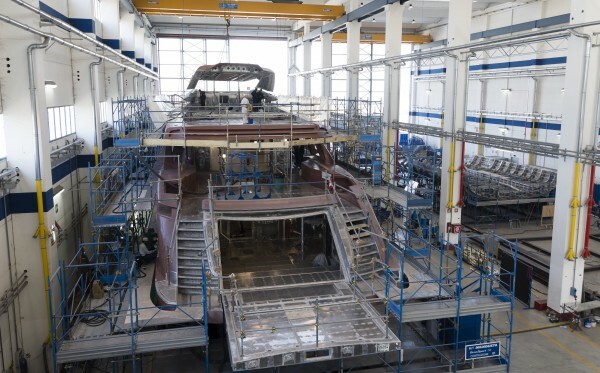 Ten months on I visited Overmarine’s shipyard in Pisa and took stock of the in-build progress of the eagerly anticipated flagship Mangusta GranSport, and its smaller 45m sibling. What was I expecting? Frankly, a lot. The Mangusta GranSport, designed in conjunction with Alberto Mancini, is to be a synthesis of the Mangusta Oceano and renowned Maxi Open. In essence, it is an amalgamation of outstanding luxury, typical of displacement superyachts, with the aggressive performance of the Maxi Open series. 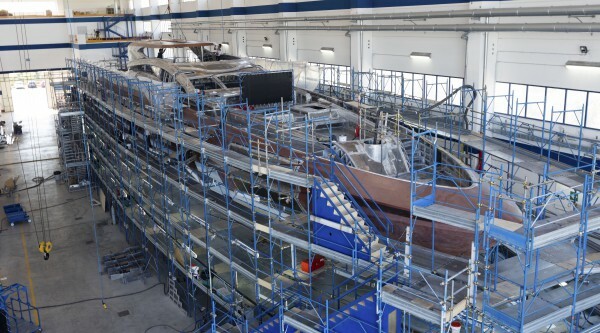 Arguably an ambitious project, particularly when looking at the sheer complexity of making a 54m aluminium superyacht feel stable and poised. Well, resting on chocks and cocooned by trestlework, the Mangusta GranSport cuts a very imposing figure in the Italian shed, and is nothing less than muscular and aggressive. Indeed, the Mangusta GranSport looks like the type of yacht that would bludgeon you with its speed, which is partly true. Quad MTU M96 engines will make up the formidable stern power plant. Producing over 10,000HP the 499gt superyacht has an expected top speed of 30 knots, and is able to maintain this over an alleged 3500 nautical miles, meaning Monaco to Montenegro is not much more than a day’s travel and a sniff of diesel. A 20 knot cruise speed for a range of 4200 nautical miles is also achievable, while intelligent CMC Marine stabilisers ensure perpetual comfort at anchor. Designed to let in copious amounts of light and frame unbroken views of the horizon against a neutral palette of soft furnishings, the contemporary and intimate interior environment for owner and 10 guests is a far cry from the aggressive and bold architectural lines of the exterior. While a swimming pool and hot tub dominate the upper deck, the stern opens up aft, port and starboard to reveal a considerable beach club space. 2017’s Cannes Yacht Show will be an opportunity to admire both the Maxi Open and Mangusta Oceano lines. But with the Mangusta GranSport expected to splash in 2018, I suspect this will be a regular topic of dockside chatter.